Last week, our group met with Alycia Sellie at the GC Library to discuss copyright, fair use, and the runway photos we collected from Vogue.com for our project. Although there are concerns to consider, we’ve come to terms with there being no easy answer and decided to move forward with developing our visualizations to supplement the analytical narrative threads we had presented in our last class session (missing data/ messy data, tokenism, and racial categorization). From the resources provided to us from librarians, it is clear that we must make an effort to “transform” the images we use for educational purposes in order to “make meaning” and illustrate our observations. If anyone is interested in those resources on copyright and fair use, please let us know and we could forward you what we have. We also intend to preserve our project in a traditional essay format. This entry was posted in Uncategorized on April 17, 2016 by Alison Boldero. Last week, we were able to attend the “People Centered Digital Research at the GC” workshop hosted by GC Digital Fellows Jennifer Tang and Patrick Sweeney, who spoke about how using digital tools or digital methods either enhances meanings or changes the way we make meanings in our collection of data. Discussions with the GC Fellows have helped us work through conceptualizing our project as well as navigate issues of race using available readings. From one such reading, “Managing the Semiotics of Skin Tone: Race and Aesthetic Labor in the Fashion Modeling Industry” by Elizabeth Wissinger, the author indicates that existing public data on models is few and far between and what has been made available by the U.S. Bureau of Labor Statistics does not provide information on race or gender. This is one obstacle our group faces and we’ve set ourselves a project deadline in the event that we’ll need to switch gears. Still, there are many avenues to explore regarding the presentation and performance of race on the runway at NYFW and we are prepared to do what we can in order to tell this story. This entry was posted in Uncategorized on March 27, 2016 by Alison Boldero. During last Week 4’s class session, our group presented to the class our project’s premise, team, and tentative project phases. We are grateful to have met with GC Digital Fellow Jennifer Tang during class, whose questions and observations regarding our project presentation helped us begin to establish more deliberate steps in collecting initial data and better articulate our project’s critical direction. Before we can begin to analyze model data, we had to create a strategy for selecting the designers who employed these models according to how often a designer was covered during the most recent New York Fashion Week that occurred between February 11 – 18, 2016, by fashion magazines carrying weight in the industry. Between the three of us, we split up nine fashion magazines and created a To-do list on Basecamp to verify our progress. Designers covered have been collected on a Google spreadsheet inside of a shared Google folder on Google Drive. Shoutout to Nico for making contact with a primary source for past NYFW data and to Scarlett for organizing a meeting with a group member from the New York City Fashion Index (NYCFI). This entry was posted in Uncategorized on March 6, 2016 by Alison Boldero. Officially, my data set project is an attempt at content analysis using a short story collection as my chosen data set. In reality, this was me taking apart a good book so I could fool around with Python and MALLET, both of which I am very new to. In my previous post, I indicated that I was interested in “what the investigation of cultural layers in a novel can reveal about the narrative, or, in the case of my possible data set, In the Country: Stories by Mia Alvar, a shared narrative among a collection of short stories, each dealing specifically with transnational Filipino characters, their unique circumstances, and the historical contexts surrounding these narratives.” I’ve begun to scratch at the surface. and fourth days [home;] one to me. shared neither a [hometown] nor a dialect. bring my work [home.] Ed didn’t mind. coffee in the [homes] of foreigners before. contract. Six went [home] to the Philippines. I drove her [home,] and then myself. we brought boys [home] for the night. I chose the word “home” without much thought, but the output reveals an interesting pattern: back home, come home, bring home. Although this initial analysis is simple and crude, I was excited to see the script work and that the output could suggest that the book’s characters do focus on returning to the homeland or are preoccupied, at least subconsciously, with being at home, memories of home, or matters of the home. In most of In the Country’s chapters, characters are abroad as Overseas Filipino Workers (OFWs). Although home exists elsewhere, identities and communities are created on a transnational scale. It doesn’t make much sense, but I would consider this a small success only because I managed to run MALLET and read the file. I would need to work further with my .txt file’s content for better results. At the very least, this MALLET output could also be used to identify possible categories and category members for dictionary-based content analysis. This entry was posted in Data Projects, Other, Resources on November 30, 2015 by Alison Boldero. Last week, I attended my first Python Users’ Group (PUG) with the GC Digital Fellows for help with setting up and accessing Python on my machine. 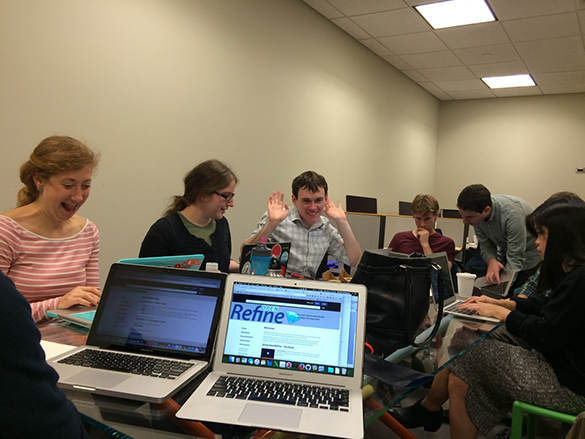 They meet every other Monday from 2 – 4PM in the GC Digital Scholarship Lab (Room 7414) to help and support students working on digital projects. So far this semester, I’ve attended several workshops but felt that the instruction I received at PUG (on both Python and MALLET) was particularly helpful due to the collaborative atmosphere and the opportunity for one-on-one discussions. Evidence of my attendance: me on the far right, confused but determined. Come to learn Python independently with a group of tutors nearby. Come with a specific Python-related question or project that you want help with. I regret not having a data set prepared to work on the last time I attended but I encourage everyone in class to go with something to work on. Since the last session, I have been working on accessing my data set (a recently published short story collection) and converting it into a readable file for analysis. This entry was posted in Uncategorized on November 9, 2015 by Alison Boldero. Last week, we discussed “thick mapping” in class using the Todd Presner readings from HyperCities: Thick Mapping in the Digital Humanities, segueing briefly into the topic of cultural production and power within transnational and postcolonial studies (Presner 52). I am interested in what the investigation of cultural layers in a novel can reveal about the narrative, or, in the case of my possible data set, In the Country: Stories by Mia Alvar, a shared narrative among a collection of short stories, each dealing specifically with transnational Filipino characters, their unique circumstances, and the historical contexts surrounding these narratives. In the Country contains stories of Filipinos in the Philippines, the U.S., and the Middle East, some characters traveling across the world and coming back. For many Overseas Filipino Workers (OFWs), the expectation when working abroad is that you will return home permanently upon the end of a work contract or retirement. But the reality is that many Filipinos become citizens of and start families in the countries that they migrate to, sending home remittances or money transfers and only returning to the Philippines when it is affordable. The creation of communities and identities within the vast Filipino diaspora is a historical narrative worth examining and has been a driving force behind my research. For my data set project, I hope to begin by looking at two or more chapters from In the Country and comparing themes and structures using Python and/or MALLET. The transnational aspect of these short stories, which take place in locations that span the globe, adds another possible layer of spatial analysis that could be explored using a mapping tool such as Neatline. My current task is creating the data set – if I need to convert it, I could possibly use Calibre. This entry was posted in Course Readings, Data Projects, Other, Resources, Uncategorized on November 9, 2015 by Alison Boldero. I also have below another Koh article that could be read in conjunction with Tom Scheinfeldt’s “Why Digital Humanities Is ‘Nice’” and Lisa Spiro’s “‘This Is Why We Fight’: Defining the Values of the Digital Humanities.” Koh focuses her argument on the neutrality of “niceness” and the exclusionary nature of more “hack” than “yack,” articulating my personal anxieties regarding the social and technical requirements of DH. This entry was posted in Course Readings, Resources and tagged DH pedagogy, HILT2015 on September 28, 2015 by Alison Boldero.